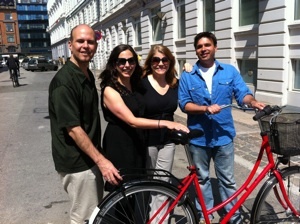 Over the summer, a group of city leaders spent a week in Denmark for a bicycling study tour, sponsored by the Green Lane Project. Delegates spent time in the cities of Odense, Aarhus and Copenhagen, observing and exploring bicycle infrastructure, planning and promotion. In Denmark, one out of every five trips is made by bike. In downtown Copenhagen, half of daily trips are made by bike, and delegates experienced a robust and mature bicycle transportation network firsthand. What were the main goals/purposes for the trip? The goals were to allow decision-makers and key representatives from each city to see how cities in Denmark integrate bicycling into infrastructure, transit and planning. I knew it would be transformative and inspiring. I was also keen to find out what they think are the “next things,” what’s innovative to a Dane? What were some of the lessons learned during the trip? 1. The Danish approach is consumer-driven. They ask people what they want; give it to them; and then thank them for using the facilities. They start every communication with bicyclists with “Thank you for cycling.” Rewarding good behavior is such a different approach from our emphasis on enforcement and accountability. 2. They also said that if they had the opportunity to start over, they’d focus more on bike parking and on driving disincentives like congestion pricing. 3. We’re often held to a very high standard of completely separating the modes. In Copenhagen in particular, it was obvious that they are not holding themselves to that standard ?there’s no such thing as perfect separation in an urban environment. They focus on designing for how people currently use the space rather than trying to force them to behave a certain way through striping or signs, and they expect people to behave in a civil way to share space. They are constantly experimenting and innovating. 4. Bike transit integration is done in a really interesting way. In central Copenhagen, they rarely combine the modes into a shared bus/bike lane. Their preferred approach is to keep them separate in dedicated lanes and signals where needed. Their rail provider offers a bike car on every train — they view it as a meaningful strategy to attract new customers, the majority of whom are women. 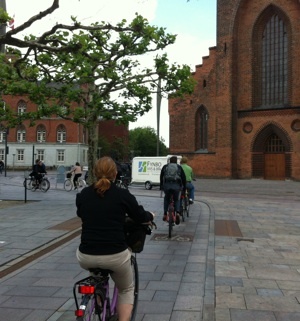 Seleta Reynolds touring the bike system in Odense. What were some of the similarities and differences between biking San Francisco and Denmark? Similarities: Bicycling is simply part of living in the cities there, as it is in certain neighborhoods in San Francisco, like the Mission. You see people of all types riding their bikes dressed in normal clothes. Differences: Their regulatory and funding environment is completely different from ours?no environmental review, no design guidelines for people with disabilities, and a focus for pedestrian planning that is heavy on public plazas and light on sidewalk or pathway planning. The sidewalk environment there is poor, although they have great plazas, which have been transformative for businesses. Behavior of both drivers and cyclists is different?far more collegial, less combative and generally more civil. The Danes are rule-followers. The biggest difference is the infrastructure?bike-specific signals at almost all intersections to separate the movements and establish clear expectations for all users; raised, separated bikeways for large swaths of the city; blue bike lanes through intersections; substantive bike/transit integration. In general, the bike is king in most of their designs, the pedestrian is second and transit is third. Are there plans to implement some of the lessons learned in San Francisco? Yes?our first raised cycle track was approved by the MTA Board on September 18, and we hope to implement a strategy to reward good behavior with our bike bell campaign. We’re continuing work to roll out hundreds of bike racks each year, including bike corrals, which could expand their capacity in the future. We’re also continuing to try to create buffering from traffic in all our bikeway designs.